With an area more than three times larger than Great Britain, Borneo Island is the third largest island in the world. Located in the Indonesian Island Chain, the giant Borneo Island contains land belonging to Malaysia and Indonesia. It also contains the tiny sovereign nation of Brunei. While Brunei only takes up 1% of the land area of Borneo, it is quite different than its neighbors. Before you travel to Brunei, go through this travel guide first. Bordered by the Malaysian state of Sarawak and the South China Sea, Brunei is a heavily industrialized country. Its wealth mostly comes from natural gas fields and petroleum, and comes in at #5 on the list of the World’s Wealthiest Nations. 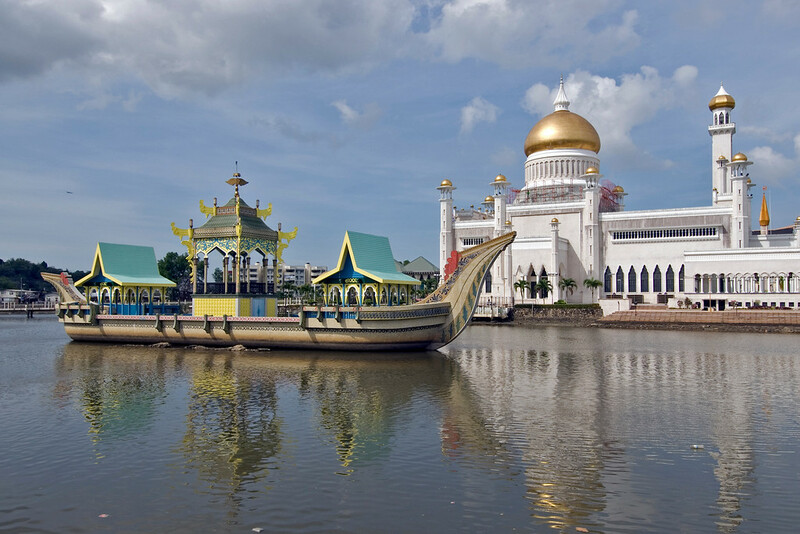 Brunei gained independence from the UK in the year 1984. Since then, it has experienced a steady economic growth from 1990s to the early 2000s (averaging 56% from 1999 – 2008). Brunei is an absolute monarchy with the Sultan of Brunei being the Supreme Head of State. All judicial cases are heard by judges, as jury trials do not exist. Shariah courts also exist, and handle Muslim issues (including divorce). The majority of Brunei is composed of lowland rainforest ecoregion. It also features a tropical equatorial climate with an annual average temperature of 27 degree Celsius. Deforestation seems to be happening at an alarming rate, although Brunei has taken steps at protecting their old growth forests in the recent past. Official Language: Malay is the official language of Brunei. WiFi Availability: You can find many shops, resorts, cafes and hotels that offer free WiFi in Brunei, especially in the major cities. Airport/s: Brunei International Airport is the hub for international flights that travel to Brunei. Visa Required: Citizens from select countries can travel to Brunei without visa (only valid passport required) such as Austria, USA, Spain, Ireland, and many more. Other countries get access for 30 days without visa (including New Zealand, Singapore, and Norway) and a few others are granted visa upon arrival for a maximum of 30 days. For Iranian residents, a 30­-day stay is allowed for diplomatic and official passports only. For more details in visa requirements for travel to Brunei, visit this link. Driving: The people of Brunei use the left side of the road when driving. International Driver’s License Accepted? You can use foreign­ issued driver’s license or an international driving permit to drive in Brunei for up to 3 months’ period. Dress Brunei is officially a Muslim country. While Sharia law in Brunei banning shorts and requiring shoulders and arms to be covered only applies to Muslims in the country, it would be prudent for both sexes to dress modestly. Crime: There is a medium level of concern for crimes in Brunei. There is a lack of freedom of the press, and the government has not been forthcoming with their statistics. What has been reported shows property crime is the most common crime, and only 21% of cases were solved. 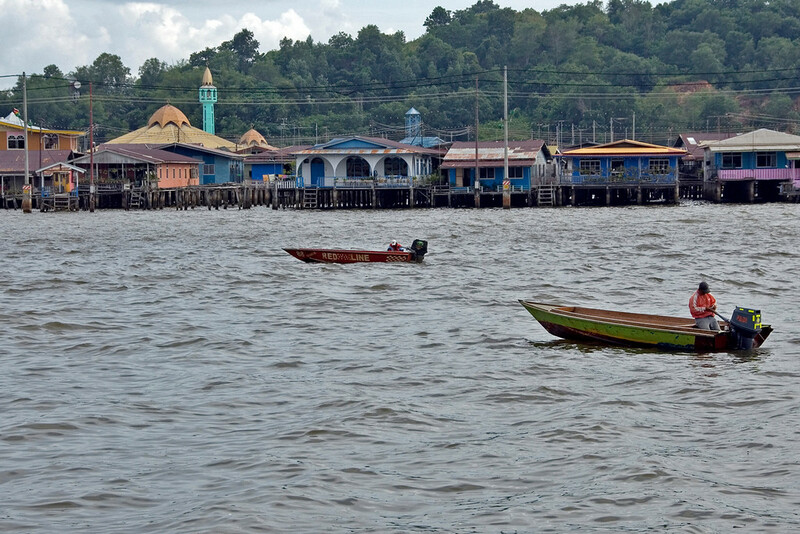 Brunei is a destination for victims of human trafficking. While Brunei has made human trafficking illegal, no one has ever been prosecuted under their 2004 law. Electrical Adapters: In Brunei, they use the British type plug. Their electrical outlets are also powered by 240 volts and a frequency of 50 Hertz. Roti – This local delicacy actually traces its roots to India. Roti is a baked flatbread dish is made with whole meal flour. There are also several recipes created with the use of roti, which makes eating it exciting since no two recipes are the same. You can fill it with meat or vegetable – you can literally do whatever you like with it! Curry – Another popular dish in Brunei that originates from India is their use of curry for cooking various dishes. The most common way of preparing curry in Brunei cuisine is when it is mixed with chicken and rice. Ayam Penyet – This dish originated in Indonesia and is one of the most coveted dishes in Brunei. It is a fried chicken that was smashed to give it a softer texture. Then, herbs and spices are added into the marinade mixture to add flavor to the chicken. It is commonly served spicy with vegetables on the side. Ambuyat – This is one dish that is native to Brunei. The dish is prepared using the interior trunk of a sago palm tree. The texture is not very pleasant as it can be slimy and has also been described as tasteless and a bit bland. It is often prepared with dipping sauce or spices to add some flavor. 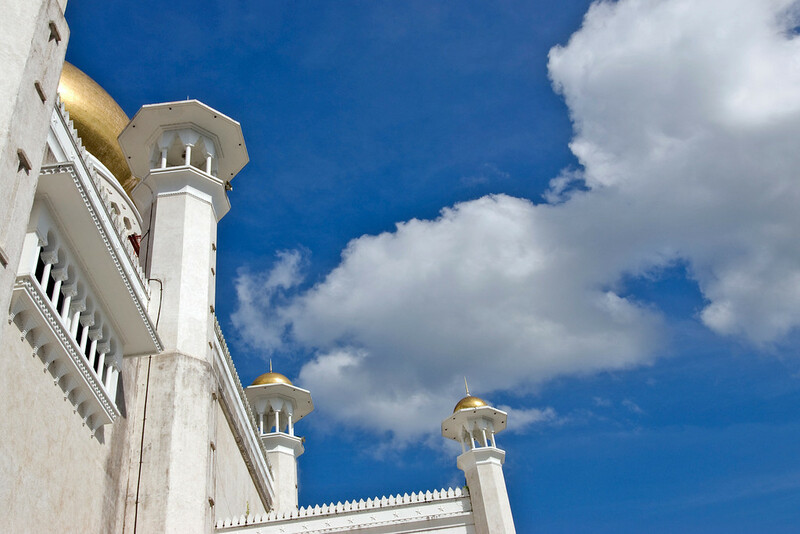 Although the majority of the citizens of Brunei are Muslim and it is the official religion of the nation, there is a significant population of Buddhists and Christians. Because of this, a wide variety of holidays are celebrated in Brunei. Traditional Islamic Holidays such as Ramadan are observed, but so is Christmas and Chinese New Year. During Ramadan, most shops close at 6 pm. Government offices in Brunei are open Monday through Thursday and Saturday, where most private businesses are open Monday through Friday. Businesses are closed between noon and two on Friday for prayers. 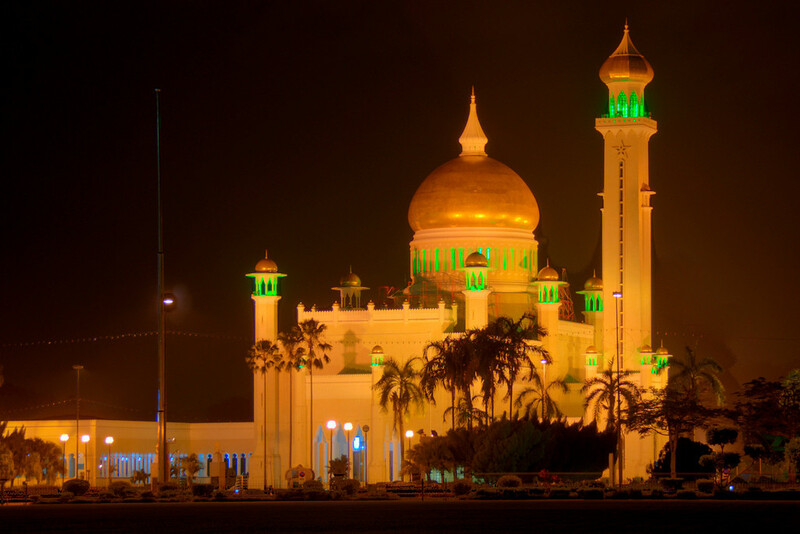 Sultan Omar Ali Saifuddin Mosque – This Islamic mosque is built in Bandar Seri Begawan. 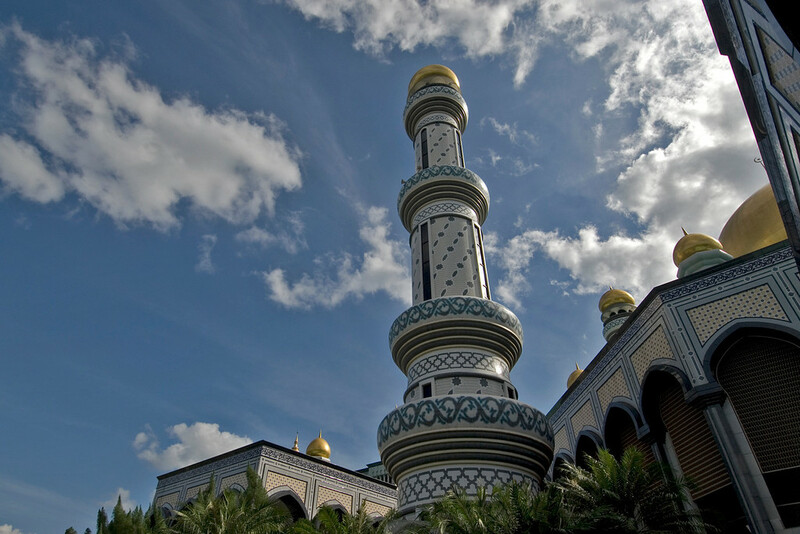 It is a place of worship and a major landmark of Brunei. It is also considered as one of the most beautiful mosques in the world. Jerudong Park – This amusement park is the smallest but most expensive theme park in Southeast Asia. The Brunei government spent $1 Billion to build the whole theme park. 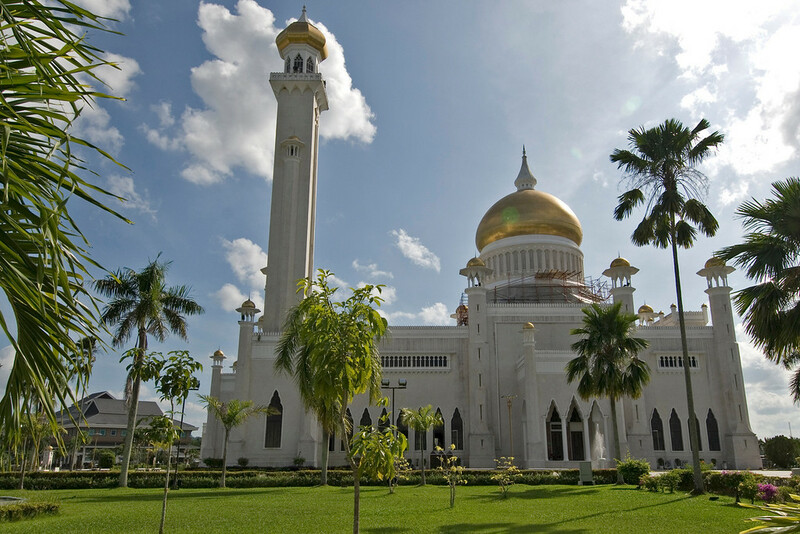 Brunei Museum – This is the country’s national museum located at the capital city. The museum first opened its doors to the public on 1969. It houses academic journals and other artifacts relating to the country’s history.